Gregory Jaczko, Ph.D., has a degree in theoretical physics, a hatred for nuclear power, and a love for his former boss Senator Harry Reid of Nevada - which is why Reid lobbied so heavily to get him placed as Chairman of the U.S. Nuclear Regulatory Commission (NRC). The Chair of the NRC, tasked with managing nuclear energy in America, hated nuclear energy? Yes and he still does, but despite that he got the job because, well, that's politics. President George W. Bush was a dealmaker and Senator Harry Reid wanted the Bush administration to ignore two decades of studies showing that America needed one modern nuclear waste storage facility, rather than over 100 that exist now, and the perfect place was under a mountain in Nevada, Reid's state. So to get Democrats under Reid's command to stop blocking 175 of his appointees, President Bush named Jaczko a Commissioner of the Nuclear Regulatory Commission (NRC) despite having no credentials. He is instead a theoretical physicist. In May of 2009 President Obama went further and appointed Jaczko the organization's Chairman (1), but he remained focused on one goal - stop Yucca Mountain. And he did. It was a stunning example of scientization of politics but Democrats surveyed were overwhelmingly anti-nuclear so it was a positive position to sell to their base. The 1970s are over, science has progressed. Union of Concerned Scientists can see it, even if anti-nuclear ideologues like Greg Jaczko won't. Yet science marches on. Though older Democrats may still be opposed to nuclear power, young people are not; with the benefit of hindsight they have been able to link President Clinton and Senator John Kerry killing nuclear in America in 1993 with the rise in CO2 emissions from coal. While natural gas has brought energy emissions down substantially, if we had stayed on the nuclear path instead of starving it from the 1970s before finally killing it in the 1990s, imagine the 4th generation nuclear technology America would have given the world. U.S. technology would have done for nuclear power what we did for cell phones and computers. There was no activist group more opposed to science during the Bush administration than Union of Concerned Scientists - and because the founding premise of their organization was anti-nuclear(2), they were key allies for Jaczko. No more, it seems. UCS recently released a report noting that if natural gas continues to replace coal, we will still have some emissions, whereas nuclear is zero. So they argue nuclear needs financial help. The same help that activists want for solar and wind - subsidies. And now Jaczko is letting them have it. 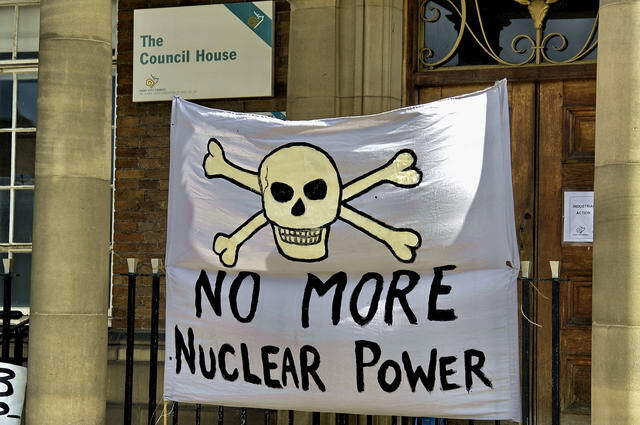 Their analysis is correct in stating that 22 percent of US nuclear capacity is at risk of early closure or slated to retire, even if they ignore that the reasons for politicians being against nuclear are that they are of a generation that came up when UCS vehemently opposed it. But younger people don't see the problem. (3) They see emissions in Germany and Japan ballooning because they canceled nuclear based on political winds. They see Europe becoming more reliant on Russian fossil fuels while they pretend wind and solar are working. No one wants poor people freezing in America because scarce energy is out of reach financially. UCS began to come around to the side of science on some issues once their President, Kevin Knobloch, officially took a job in the Obama administration, and that should be applauded. Instead, Jaczko wants to pretend it's the science that has not advanced since 1979. In a statement he wrote, “The Union of Concerned Scientist models don't reflect the reality of the United States electricity market. Renewables are getting cheaper faster than expected and are in some cases the least expensive source of electricity." His command of nuclear science was always "theoretical" and it seems his understanding of economics is similar. Nothing he wrote is accurate. Claiming that something is getting cheaper 'faster than expected' ignores that without ongoing subsidies, few would take up solar now. The only way it works is on the backs of utility companies allowed to pass the costs along to people without solar. Who is without solar? Poor people, and those in regions that don't get a lot of sun. Ironically, he did his best to make nuclear unaffordable by blocking it at every turn and now uses that to say nuclear is not worthwhile. Really, he is trying to drum up attention for an upcoming book, "Confessions of a Rogue Nuclear Regulator", but even his title is inaccurate. He was never "rogue", he was appointed to his job precisely because he was the ultimate insider - he literally got the job as political quid pro quo to stop his boss from being obstructionist about 175 other people. And his stance against science was reliably where older Democrats wanted him to be. But those days are now gone, young Democrats are not inclined to be anti-nuclear energy simply because Republicans are for it. And that is a good thing for all of us. (1) In 2012 President Obama replaced Jaczko with someone both less qualified and even more opposed to nuclear power; Dr. Allison Macfarlane, a geologist with the anti-nuclear activist group Bulletin of the Atomic Scientists, who try to keep the public on red alert about their issues with their "Doomsday Clock." (2) Claiming only nuclear weapons in writing but no one was fooled; when President Clinton put a knife into the heart of nuclear research in the U.S. he said it was because any nuclear science, including energy, could be weaponized. Scientifically incorrect but dog whistling to Greenpeace, UCS, and more. (3) And older critical thinkers have come around as well. Oscar-nominated Director Robert Stone, of the anti-nuclear weapon documentary "Radio Bikini", later made the pro-nuclear energy documentary "Pandora's Promise."